I want to be a writer when I grow up. In the meantime, I work at a little café for just a wee bit more than minimum wage. Sometimes it’s exhausting. Sometimes it’s hard to juggle my day job as a barista and my freelance graphic design gigs and trying to Be A Writer and getting photos and widgets ready right here on the SheLoves blog and nannying and all my adventures in between. But then there are days like today. Today I got up a little early to write a bit before meeting The Professor for breakfast. I became friends with The Professor at my café. He’s wicked smart. He is only 30 and he already has a PhD. Today we talked about feminism and religion and childhood trauma, because, you know, that’s what you talk about over breakfast with a professor. He says my memoir will be a hit if I ever get around to writing it. A couple hours later The Blogger instagrammed the business cards I designed for her. The Blogger always gets an Americano with white chocolate. We bonded over a mutual love of sushi and vintage cameras. We try to go out for lunch every couple weeks and sometimes I have to cancel. She always forgives me. And then today changed me. It changed me when I told Quiet Mama how much I’m going to miss seeing her two beautiful children and her smiling face when they move next month. She isn’t in very often and she seemed surprised that she matters so much to the weird barista leaning over the booth to chat with her. But she does matter. And you know what happened next? Quiet Mama cried. She let quiet tears stream down her quiet face and she talked about loneliness and stress and a struggling ministry. She talked about surgery. And then she talked about cancer. I looked over at her Not-So-Quiet children and I hugged her. Her tiny daughter asked for a hug too. We hugged and we cried. Today, I wondered if I really want to Be A Writer. I mean, it’s not like I can stop, but maybe I don’t need to “make it” in the world. Maybe I don’t need a platform. 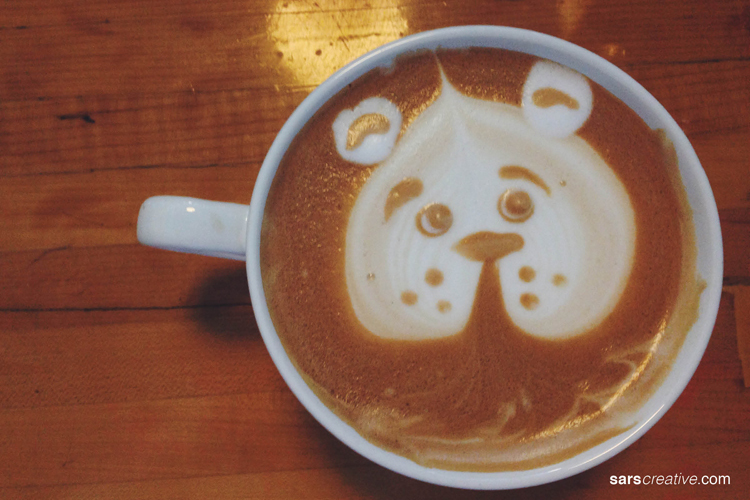 Maybe who I am is perfectly suited for this little café in North Tacoma where I get to make animal faces in foam and chat long enough to make friends. Maybe holy ground isn’t in the places I think it will be. Maybe sacred space is created when I allow God to make my ordinary spaces sacred.